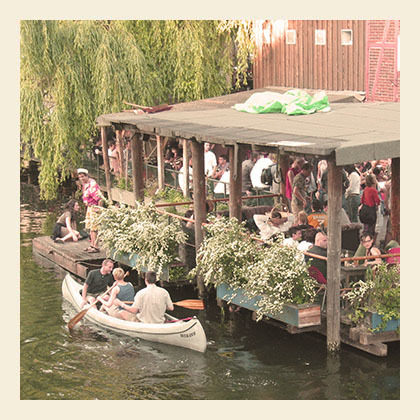 Mondays at EastSeven Berlin Hostel…. it´s always a great thing to be staying in Berlin @ the EastSeven Hostel on a monday! For over a year now the EastSeven Berlin Hostel offers her guests a free meal on mondays….So there is no need for a monday evening to be boring!! Our cook Florian is simply the best! He knows the best recipies and makes every vegetarian dinner tasty and delicious. If you want to learn some of Florians cooking-tricks then make sure to meet up with the cook at about 7pm at the hostel kitchen! Because then the cooking WORKSHOP starts! It´s a lot of fun, and it´s the best way to meet other travelers. At the reception, our friendly receptionists sell the best german beer, between 8 and 10 pm for only 1€, it´s amazing! After the dinner party go to one of the nice clubs and bars that surround the hostel! For instance you could go to DR.Pong…That´s always fun! Here you can play table tennis all night long, drink beer and enjoy the great electronic music! If you are coming to Berlin you are more than welcome to stay at the EastSeven Berlin Hostel! Please check the website to find out about availability. Also check out our online staff-recommendations to see what´s going on in the capitol of germany!